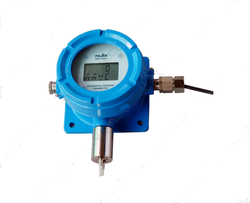 We are a leading Producers of differential pressure transmitter-dual lcd-dpt511, differential pressure transmitters-dual lcd, differential pressure transmitters, pressure transmitter, diff pressure transmitter and dp transmitter - dpt511 from Mumbai, India. DPT511 is a programmable, microprocessor-based, differential pressure transmitter. It is user configurable for pressure range and unit. It is designed operated at a very low-pressure application such as Clean rooms, hospitals, fume hoods and computer rooms. SC504 is a 2-wire differential pressure transmitter housed in an IP65 enclosure made of ABS plastic. By deploying pressure tubes into two different areas, SC504 measures, displays and transmits the difference in pressure between those areas. This transmitter is widely used in pharmaceutical facilities that must maintain a pressure gradient to prevent cross-contamination of the various materials within its rooms. In a typical pharmaceutical BMS (building monitoring system), SC504 is installed on the service floor above two rooms with pressure ports in each room’s ceiling. 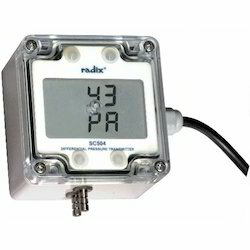 Via a 4-20 mA signal, Radix often pairs SC504 with our proprietary Clean Room Display to indicate differential pressure for operators inside the rooms.The transmitter has its own 4-digit LCD display and is easily configured via a dip switch or PC to indicate differential pressure in a wide range of units - Pa (pascals), mmWC, mbar, inWG, inHg, PSI, mmHg. SC504’s micro controller technology linearizes the input which makes control more effective. If programmed by a computer, you will require a PC configurator, PCC82 by Radix. A push button on the unit allows easy auto-zero adjustment. SC502 is a 2-wire differential pressure transmitter housed in an IP65 enclosure made of ABS plastic. By deploying pressure tubes into two different areas, SC502 measures, displays and transmits the difference in pressure between those areas. This transmitter is widely used in pharmaceutical facilities that must maintain a pressure gradient to prevent cross-contamination of the various materials within its rooms. In a typical pharmaceutical BMS (building monitoring system), SC502 is installed on the service floor above two rooms with pressure ports in each room’s ceiling. 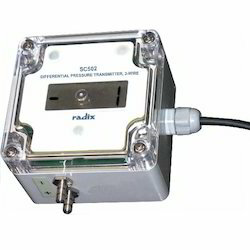 Via a 4-20 mA signal, Radix often pairs SC502 with our proprietary Clean Room Display to indicate differential pressure for operators inside the rooms.The transmitter has its own 4-digit LCD display and is easily configured via a dip switch or PC to indicate differential pressure in a wide range of units - Pa (pascals), mmWC, mbar, inWG, inHg, PSI, mmHg. If programmed by a computer, you will require a PC configurator, PCC82 by Radix. A push button on the unit allows easy auto-zero adjustment. SC502 is a 2-wire differential pressure transmitter utilized to indicate the pressure difference between 2 areas by deploying a pressure tube in each. The differential pressure is displayed on a single 4-digit LCD display on the unit. The indicated pressure units and range are programmed through a dip switch or PC. PCC82 is required to program the transmitter. SC502 is auto-zeroed via a pushbutton switch. DPT511 is a programmable, microprocessor-based, differential pressure transmitter. It is user configurable for pressure range and unit. It is designed operated at a very low pressure applications such as : Clean rooms, hospitals, fume hoods and computer rooms. 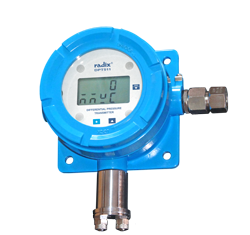 Looking for Differential Pressure Transmitters ?